Avastin is an anti-Vascular Endothelial Growh Factor used to treat wet AMD, retinal vein occlusion, diabetic macular edema, and other causes of macular edema. Avastin is a medicine that blocks the effects of vascular endothelial growth factor (VEGF). It works the same way as Lucentis and Eylea. 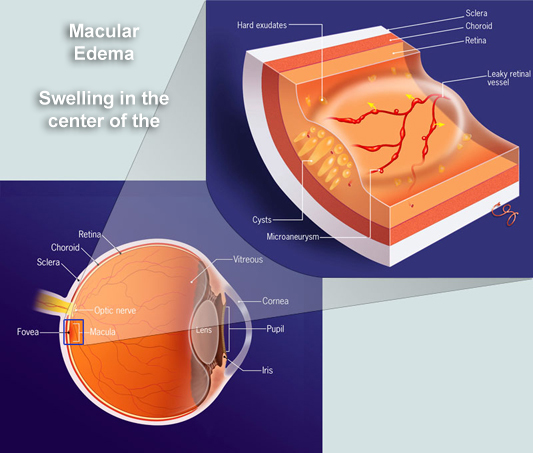 By blocking the effects of VEGF, it is an effective treatment for macular edema from almost any disease. Macular edema swelling of the center of the retina. It is most commonly used to treat macular edema from age-related macular degeneration, retinal vein occlusion and diabetic retinopathy. Avastin was initially approved by the Food and Drug Administration (FDA) as a treatment for different types of cancer. Its use to treat eye disease is considered an "off-label" use. The FDA allows the use of drugs for conditions other than those for which it is approved if doctors are well informed about the product and proof has been shown of the drug's positive effects. Based on a study funded by the National Eye Institute (NEI), a part of the federal National Institutes of Health (NIH), the two drugs have equal effect on visual acuity in common retinal conditions. A survey of retina specialists in the United States performed in 2017 showed that Avastin is used about twice as often as Lucentis or Eylea for wet AMD. Avastin is repackaged by compounding pharmacies under sterile conditions for use in the eye. Avastin comes in a large vial meant for use in cancer patients. Then it is drawn into many small doses that are used for eye injections. A single large vial produces about 20 smaller doses adequate for intravitreal injection. 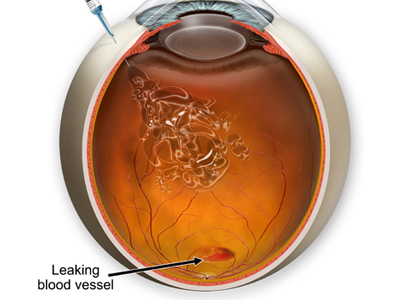 Avastin, like all anti-VEGF medications is injected into the vitreous cavity. The medicine wears off and needs to be injected monthly at first. After the first several injections, some patients continue monthly treatment, some patient are treated at increasing intervals and some patients are checked monthly and treated as needed. The initial studies comparing Avastin to Lucentis showed the Avastin is most effective if given monthly. How does Avastin Compare to Eylea and Lucentis? There have been a few studies comparing the effect of Avastin to that of Lucentis and Eylea in common retinal conditions. These results show that Avastin is as good as Lucentis when administered monthly and slightly inferior when administered less than monthly in wet macular degeneration. Additional results show that Avastin is similar to Eylea in diabetic macular edema, except perhaps in patients with very severe disease (as of this writing in January 2018). 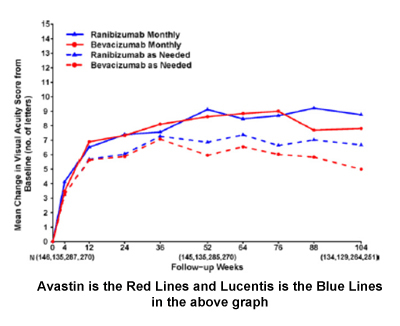 The results of the CATT study comparing Avastin to Lucentis in wet macular degeneration are shown in the accompanying graph.